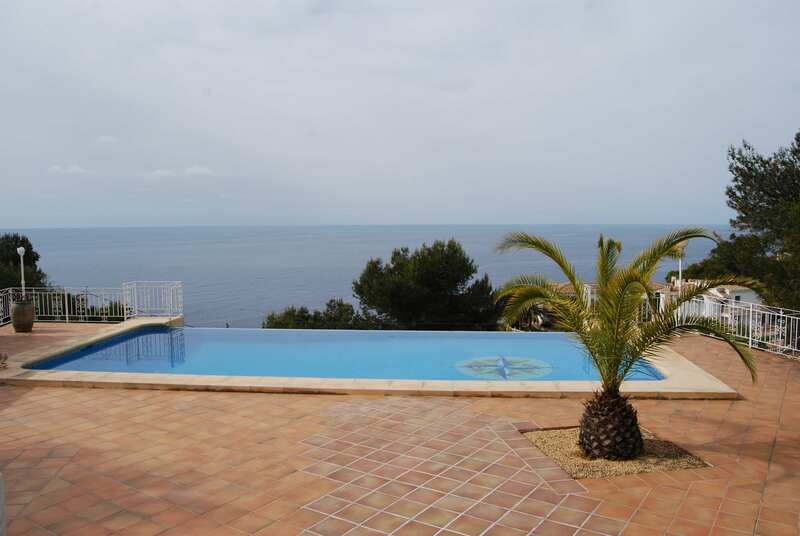 Traditional Villa with sea views, located in the popular Urbanization El Tosalet, Javea, with 24hour surveillance. Double gates leading to a parking area with carport and garage. The main living area is one level, spacious open Naya, Entrance hall, lounge with fireplace, dining area and glazed sitting room with sea views. The kitchen is in located in the center of the property and has access from two sides and Utility room with storage. Five bedrooms and four bathrooms (two are en suite).The master bedroom has its own living room with log burning fire and direct access to the garden. Poolside independent apartment with an open Naya, lounge and dining areas, summer kitchen, shower room with WC. Possible to add a 2nd level of 100m2. The Mediterranean landscaped and private garden with various terraces is full of different trees, plants and lawn areas with automatic irrigation system. 10×5m swimming pool with terrace area. The property has electric heating and two fireplaces. 340m2 is the total construction including the pool and outbuildings. The land/plot of 2,514 m² is fully fenced and wall with Various Terraces. The property is in good condition, some areas need modernization.